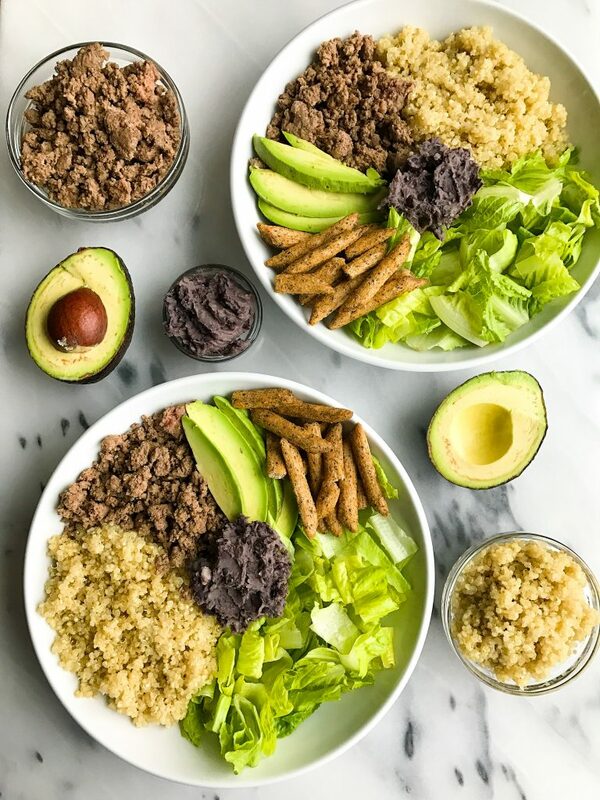 The easiest 10-minute Taco Bowl with Black Bean Dip for a healthy lunch or dinner bowl! During the week my days are a little insane. I either am spending all day in the kitchen doing recipes, food styling and photographing for hours or bouncing from meeting to meeting. Like most of us, I don’t really have time to prep a gourmet lunch everyday, even though that does sound quite nice. And meal prepping has been a life saver for me so that I don’t end up just eating bars and toast all day. I love prepping different veggies, grains, meats, etc. in the beginning of the week and munching on them in different bowls for lunch and dinner during weekday craziness. One of my most favorite go-to bowls right now is this 10-minute Taco Bowl with Black Bean Dip. It is a DREAM. 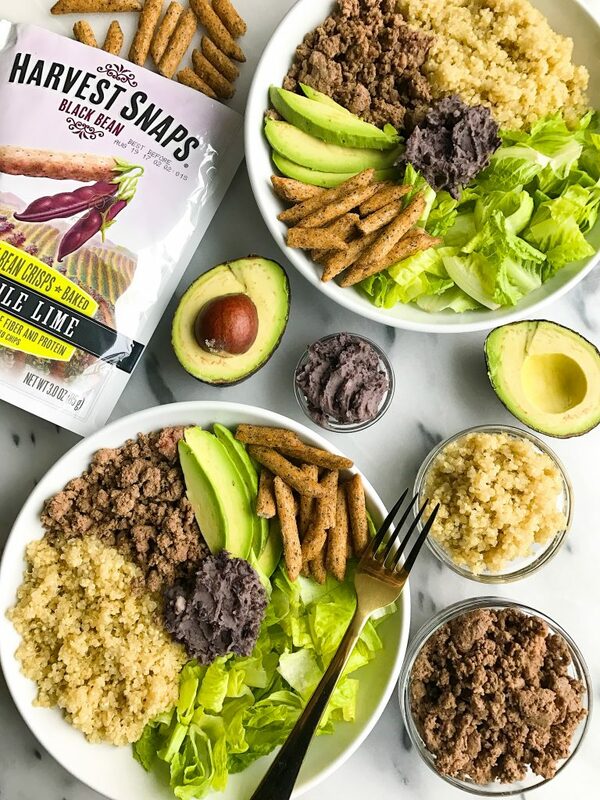 Filled with healthy fats, protein, carbs and the easiest black bean dip, it is such a simple way to dress up any boring lunch. When you get over the color of black bean dip (I mean, it looks kind of charcoal-like, I know), and add it to your food, you will love it. 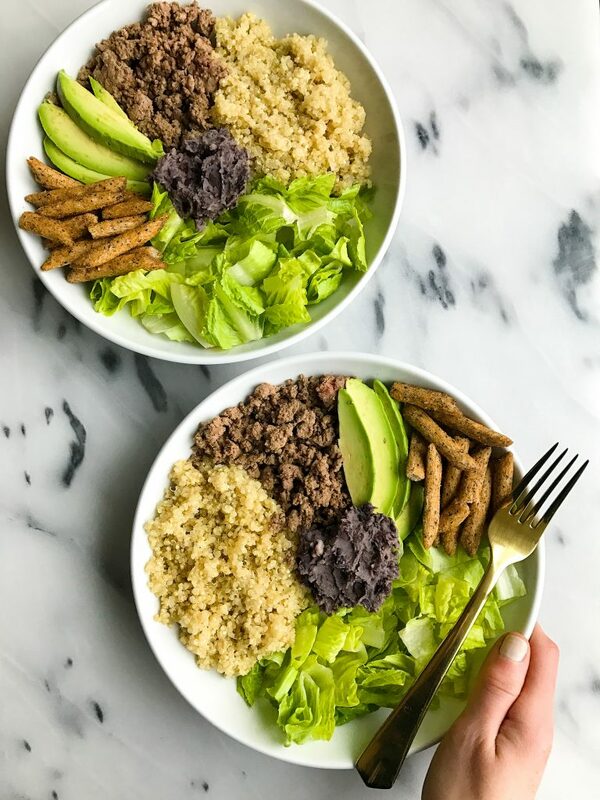 It goes so well in this bowl filled with quinoa, grass-fed beef, avocado, romaine and my favorite crunchy Harvest Snaps. I used the black bean ones and love the Mango Chile Lime flavor. They add protein, fiber, a flavor boost AND a crunch in this bowl. I love using them in place of a chip or tortilla strips to spice things up. You may remember their snap pea crisps from the Chickpea-less Beet Hummus. The best part about this taco bowl? It only takes TEN minutes to make. I love quick bowls of delicious food. The idea of making different foods at the beginning of the week that you can throw into bowls for your busy lifestyle is a great one!